Disclosure: Blue Orange Games sent me a complimentary copy of this game. All opinions are my own. Does your family enjoy puzzles? How about games? If so, keep reading because Blue Orange Games combines the two in their new game, Brain Connect. It’s the perfect fit for my own kids — competitive puzzle playing! You have to think fast and use fine motor skills to solve this sliding puzzle race. If you’re looking for a game that gets kids thinking — this is a great choice. Plus, you’ll get in practice with visual perception, processing speed, and fine motor skills. 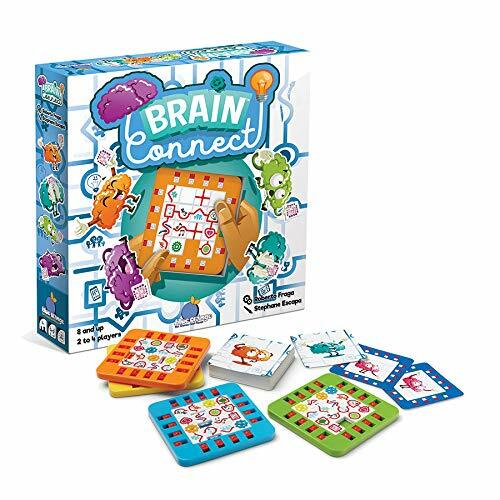 Brain Connect is for ages 8+, 2 to 4 players, and takes about 25 minutes. Players use colored sliding puzzles to play with 16 different start and stop points. These might look similar to single player sliding puzzles you’ve seen before but now you’re going to use them in a family game. To play, players turn over a card, see where the green squares are indicated, and switch the matching red border tabs to green. The object is to slide and rearrange the tiles on your colored puzzle so you’ve connected the two green squares with one continuous line. There may be multiple answers possible. Just a heads up –the sliders are stiff at first. We found that it takes a few minutes to get the hang of it. You’ll want to practice pressing to get them to slide to the empty spots. From a parent and teacher perspective, I love how strategic this game is. Players need to think ahead to where they want all the tiles to be on their puzzles. If they just focus on one tile at a time, they’ll never finish first. You have to have a long-range plan. The first person to finish wins 3 cards, the second wins 2 cards, and the third wins 1. The first player to win 10 cards is the winner. We really like this game. And I even beat my kids a few times which is normally impossible! 🙂 My new family game playing strategy is not be tired… It apparently helps with my success. Would your family enjoy this game? Strategy games are so important for young minds as it grows stamina during the problem solving–ultimately a life skill we all want our children to have! Thank you for sharing this review!